The Standard of Excellence band method combines a strong performance-centered approach with music theory, music history, ear training, listening, composition, improvisation, and interdisciplinary and multicultural studies. The result is the most complete band method available anywhere. FOR ... ONLY exercises offer idiomatic solutions to the unique challenges of each instrument. Note: This method book does NOT include play-along accompaniments. 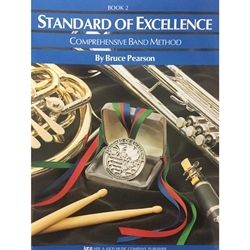 If you want play-along accompaniments, you can either purchase this item combined with the "Standard of Excellence Enhancer Kit" (sold separately), or purchase "Standard of Excellence Enhanced" (a different item which has the same content as this book but includes the CDs as well).